Turtles have always been kind of a mystery in paleontology. Their fossil record is not very good, so the first fossil turtles we discovered already looked like modern turtles. Have you ever thought about how weird turtles are? They are so different from all other vertebrates. First, they have a shell. That shell is in 2 parts: the carapace (the back shell) and the plastron (the belly shell). The carapace is made up of the ribs, vertebrae, and scutes (new outer bones). The plastron is made of scutes. These two pieces come together along the sides of the turtle and form a complete shell. You cannot pull a turtle out of its shell because its shell is made out of its bones. This cannot happen. From here. Most turtles can pull their necks, arms, and legs into their shell for protection. But that means their limbs are INSIDE their ribs. Are *your* limbs inside your ribs?? NO! They are on the outside. Just like in every other vertebrate. Turtles are unique in having their limbs attach INSIDE their ribs instead of outside. A turtle cut in half (from Encarta). Also, turtles have beaks instead of teeth. 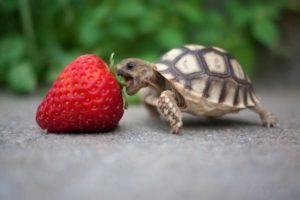 Because of all these unique traits, turtles are not easy to place in the vertebrate evolutionary tree. However, we now have enough fossils specimens with different stages of shell evolution that we can understand how the shell developed over time and more importantly, why it developed. 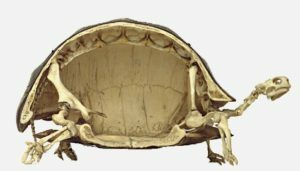 A new [article] examined some new fossil specimens of early turtles, ones that do not yet have full shells, and have discovered something interesting. 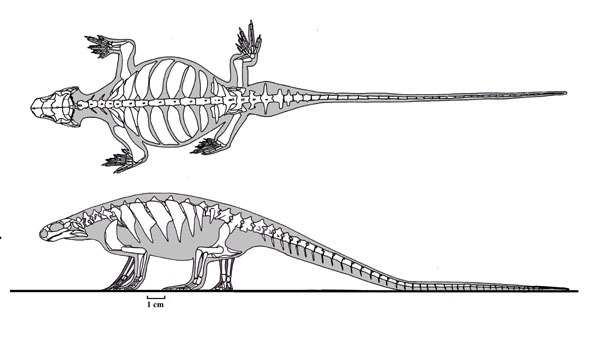 The sequence of evolution of the shell starts with the ribs becoming very wide. Wide ribs make the torso rigid (the opposite of flexible) and this has 2 consequences. 1) It makes breathing difficult and 2) it makes locomotion difficult. In response, the turtles changed how they breath and slowed down. Eunotosaurus skeleton showing the wide ribs. From here. This ribs also make a sturdy base that won’t move if you are moving your limbs for something else – like digging. 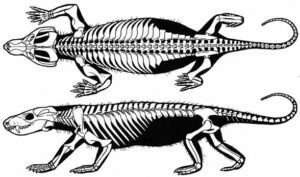 Other animals that dig, like the extinct Thrinaxodon, a mammal-relative, and the burrowing turtle, Gopherus, both have very wide ribs that keep their bodies stable while they dig. Thrinaxodon showing its wide ribs (from Wikipedia). 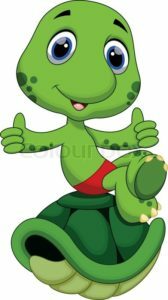 Other features like a short and wide head (to brace against the ground), and large hands and a wide humerus (upper arm bone) to dig with, along with bigger areas for muscle to attach, all tell us that early turtles were digging! Because of the similarity between digging and swimming, these adaptations made it easier for turtles to move back into the ocean later. Figure 1A from the paper showing the sequence of shell development in turtles. Turtles are amazing and very unique animals and now we know a little bit more about them.